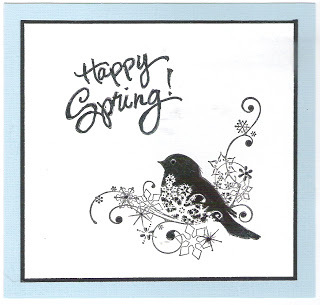 It's only the end of February but with the sun shining so brightly, I was in the mood to start my Spring cards. I had planned on making a black and white card but then decided I would soften it by layering it with a soft blue cardstock. The gemstone I used for his eye is from Hero Arts. The bird image is from Inkadinkado and the Happy Spring verse is from PSX.